Also known as the New Zealand Mussel and Green Shell Mussel. It is an edible mollusc. 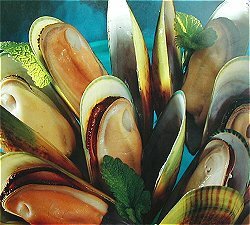 Greenshell mussels (Perna canaliculus) are native to New Zealand. Imported from New Zealand. Greenlip mussels are available year-round, but meat yields and harvests decline following the winter spawning season. 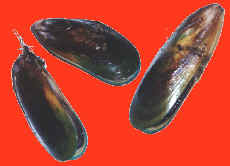 This species of mussel is endemic to New Zealand, and is also an introduced pest in Australian waters. 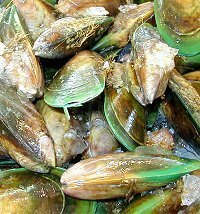 Green Mussels (Perna canaliculus) are imported frozen from their native New Zealand. 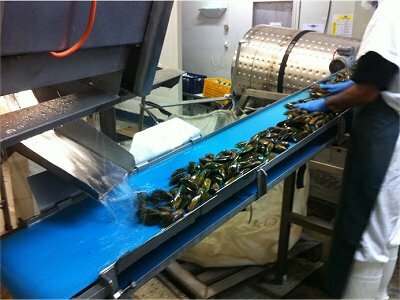 They are generally larger than Blue Mussels, averaging 11cm and 60g, and are partly cooked before being exported in order to satisfy Australian quarantine bans on the importation of live animals. Because of this initial cooking, they aren’t suitable for cooked dishes, as they tend to turn tough when recooked. 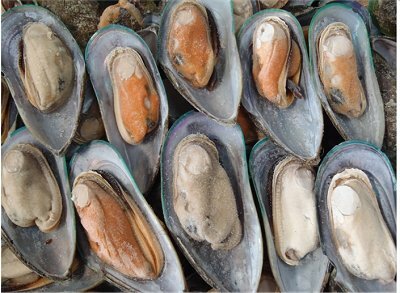 While they grow "wild" in waters around the coast, it is farmed Greenshell mussels which are today firmly established as New Zealand's second largest seafood export. The shellfish is recognisable by its emerald green shell markings. The flesh is full and plump, and richly flavoured. The flesh of the female is a soft-blush apricot colour, and the male a pale creamy colour. Green Lipped Mussels contain five kinds of Omega-3 (EPA, DHA, ETA, OTA, etc) all of which are necessarily for the human body. Green Lipped Mussel Extract also contains a rich blend of natural proteins, minerals and mucopolysaccharides. These naturally occurring Mussel Extract substances are increasingly being recognised as helping joint mobility, cartilage maintenance, good health and general well being. Taste/Texture The flesh is full and plump, and richly flavoured. This shellfish is economically important to New Zealand. Greenlip mussels differs from other mussel species in that it has a dark brown/green shell, a green lip around the edge of the shells and only has one adductor muscle. It is also one of the largest mussel species reaching 240 mm in length. The industry developed on the exploitation of wild mussels, however there is no longer any commercial operation involving a wild fishery. 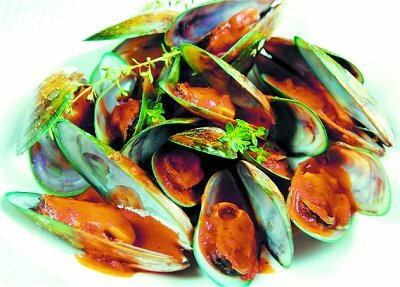 As an aquaculture species, the government sets no limit on the volume of mussels extracted commercially. Mussel Farming takes place in the Marlborough Sounds, along the Coromandel Peninsula, and in Stewart Island's Big Glory Bay. A mussel farm consists of a series of buoys held together by long lines attached to each side of the buoy. The line is anchored to the seafloor at each end. A series of weighed ropes, on which the mussels are grown, hang down from these lines. Juvenile mussel spat are wrapped to these ropes using a stocking mesh. The mesh later disintegrates, by which time the spat have attached themselves to the rope. They are then left to grow. When they reach a desired size, the rope is lifted and the mussels stripped from it. Mussel farms tend to act as man made reefs, and so attract large numbers of small fish.